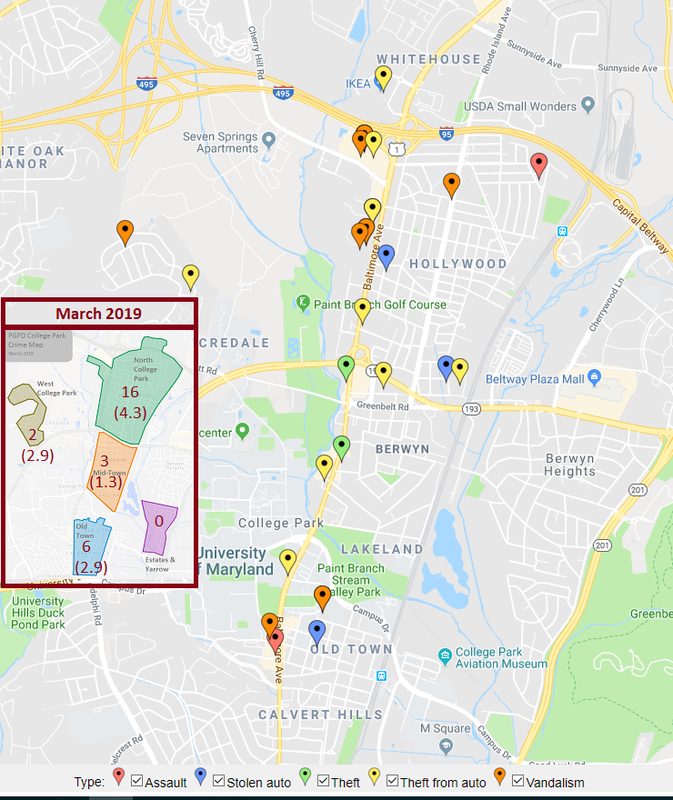 The College Park March 2019 PGPD crime map was generated from the PGPD crime data for the period of March 3 – March 31, 2019 (Beat 7) and March 5 – April 1, 2019 (Beat 6). The interactive map can be seen here: http://bit.ly/2TQYMqH. Here is the summary of crime incidents by major neighborhoods. Last month, some of you asked me to present the population in the each major neighborhood along with the crime data in the corresponding neighborhoods. Unfortunately, U.S. Census does not give us the number of residents living in each neighborhood. That said, I’ve compiled the number of housing units in the major neighborhoods and calculated the number of crime incidents per 1000 housing units. Hopefully, this will give a better crime indicator in these neighborhoods. Please note that, when it comes to crime analysis based on population, it’s also important to include the transient population in addition to the residents population. The transient population includes people who work, study or visit the city, but do not live in the city. For example, a good percentage of UMD’s staff and students do not live in the city, but frequent the midtown and downtown areas of the city and fall in this category. Unfortunately, we do not have counts of this category of population.